Stock product - detailed vector illustration - 2D Vintage Collection - English Cuts 01 - created by Aurielaki. Image formats EPS AI JPG. 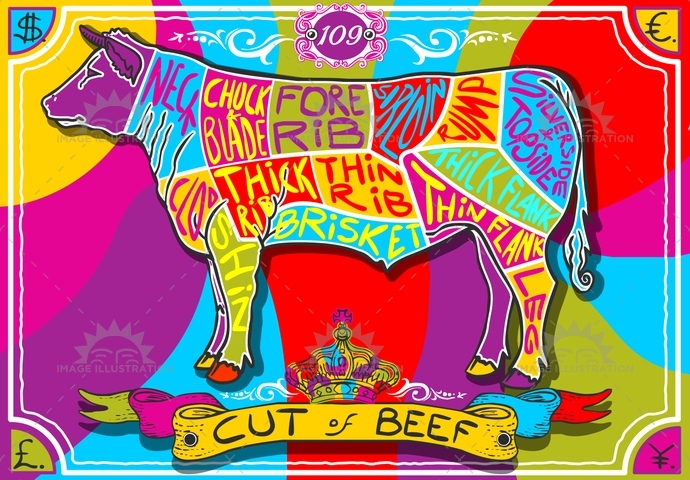 Vintage English Cut of Beef in Happy Rainbow.Illustration in EPS AI JPG with color space in RGB. . .
SKU: English-Cuts-01-Vintage-2D-AurielAki. Category: Beef Cut Blackboard. Tags: aged, ancient, antique, banner, beef, ButcherShop, butchery, color, cow, crayon, cuisine, decoration, dollar, english, euro, food, freehand, gastronomy, handwriting, happy, meat, menu, old, pound, rainbow, retro, typography, vintage, yen.